Archaic Greek marble colonnette. Eṣṭaḵr, Fārs province, Iran. Sixth or early fifth century BC. Excavations of E. F. Schmidt (Oriental Institute of the University of Chicago), 1935. Oriental Institute of the University of Chicago. 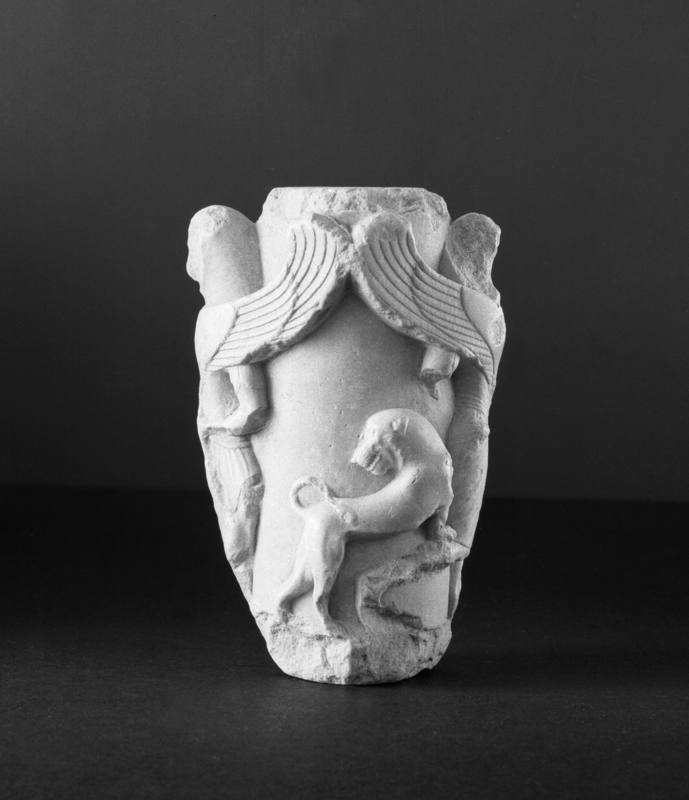 H. 0.114 m, W. 0.074 m.
The marble colonnette, decorated with relief gorgons and lions, is reported to have been discovered in a context of 'mixed Islamic and pre-Islamic debris' in the vicinity of the ancient mosque ('western building') at Eṣṭaḵr. 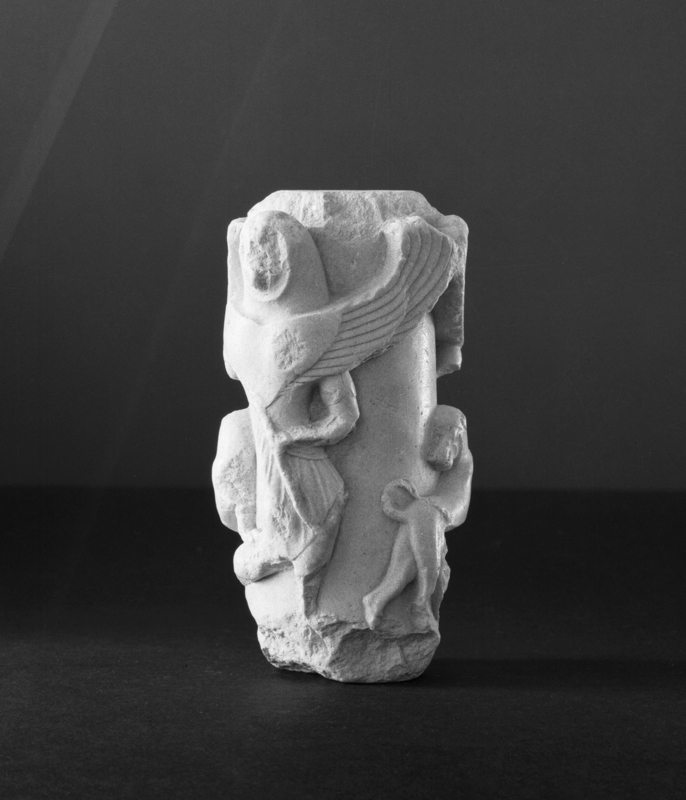 At the time of the discovery, owing to a primary association of the beginnings of the site with the Sasanian period, the object was tentatively ascribed a Sasanian period date (Schmidt 1939: 119-120, fig. 87; cf. Bivar 1995: 35-37 and idem 1998: 52). Its subsequent identification as a late archaic Greek work is owed to John Boardman (e.g., 2000: 137, fig. 4.10). In keeping with the view of Eṣṭaḵr's post-Achaemenid foundation date, Boardman suggested that the colonnette must have been carried from nearby Persepolis. Mohammad Taqi Atāyi's recent hypothesis, arguing for the existence of an Achaemenid columned hall, built by Darius I (522-486 BC) or Xerxes (486-465 BC), in the western sector of the site, could leave open a possible local Achaemenid context for this archaic Greek find. Bivar, A. D. H. 1995. 'The royal hunter and the hunter god: esoteric Mithraism under the Sasanians?' In Gyselen, R. (ed. ), Au carrefour des religions. Mélanges offerts à Philippe Gignoux. Res Orientales 7. Bures-sur-Yvette: 29-38. ——. 1998. The Personalities of Mithra in Archaeology and Literature. Biennial Yarshater Lecture Series - BYLS 1. New York.